This 1-inch badge has an important message. It is a black badge with the text Support Local written in a bold white font and three vegetable illustrations at the top. 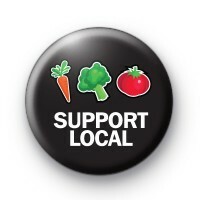 It is a gentle reminder that where possible you should support your local farmers and shops. It is good for the environment and your local community. Also, the food tastes better if you buy locally grown vegetables and food from local farmers. It is true that organic and plant-based produce is more environmentally friendly. If you're looking for green, Vegan or Vegetarian badges we have lots of designs in the shop & they're all handmade by us in Cornwall (with love).